Regatta Week at Georgetown began last Monday and ends this Thursday. There are activities every day and thanks to new friends on Interlude, Cathie and Tom, we have participated in a few. Above we are with them on their monohull in the Around Stocking Island Race. It is about 20 miles and took us under four hours. 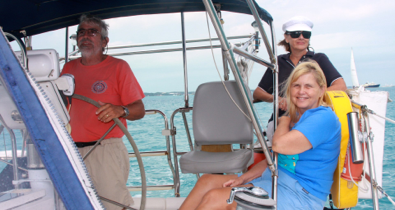 This was our first experience sailing in a monohull. In the photo we are just starting out and haven’t begun to heel. It was an almost ideal day for our first experience. 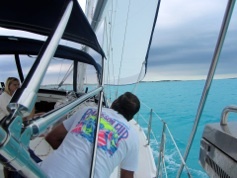 The wind was only about 15 kts and the seas on the Exuma Sound were under two feet. It was very comfortable. For part of the time we were in Elizabeth Harbor and for the other part we were out on the Sound. We averaged 6 kts with no motors on of course. We came in third in our class. Boats are handicapped and grouped close to similar size and sailing speed. It was quite a different experience and Mark and I basically watched. 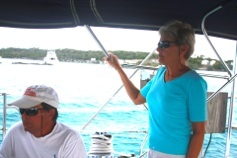 The other two crew members were Fred and Karen (Southerly II), pictured above. This was one of the very few times they were just enjoying the sail. They are very experienced racers and own a cruising monohull now. They were a big help to Cathie and Tom, raising the sails and constantly adjusting them for maximum speed. We are obviously spoiled on Seas the Day because when we raise our mainsail, we just press a foot on a pedal and the sail goes up. Everything we do is done with electric winches. On Interlude it’s much more manual. In other words, they are real sailors. At the right we are heeling, not nearly as much as they do in rougher weather, but for us newbies it was fun, not scary. As the day wore on the skies turned dark and we were racing to get back to the anchorage before a predicted front came through. We passed the finish line, dropped the sails and got back to Interlude’s mooring ball. Elizabeth Harbor has some mooring balls available and since Interlude and Southerly knew they would be here for more than a month, they decided to stay in comfort on balls, not having to worry about weather. Within 15 minutes after getting tied to the ball, the front entered the harbor with winds over 20 kts. 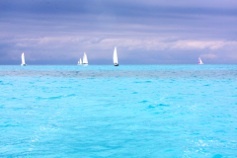 We went back to Seas the Day in our dinghy, crashing through building waves that came over the front of the dinghy. For the rest of the night we bounced around in sustained wind in the high 20 kts with gusts over 30 kts. There are close to 300 boats in at least eight large anchorages and three mooring ball “holes.” Some people lost their dinghies and kayaks (rescued by other cruisers) and a few boats dragged their anchors. There was a party at the St. Francis for the racers, but we didn’t want to leave our boat in those weather conditions. To see more photos of the race click here. Today we took part in a scavenger hunt with Interlude and Southerly II. There were 30 items to find around the area. Some we could find by googling, for example the first line of the Bahamas National Anthem. Sometimes we had to take a digital picture of something. Some were impossible for us to find, such as 4 inch high heels. (Some people did find those.) It was great fun. We divided up the items and spread out over the island with our three dinghies. We didn’t win, but came close. On Tuesday, we’ll be out on Interlude again for the “In Harbor Race.” For that, we’ll sail from point to point within the harbor, not going out on the Sound. We plan to stay here until at least the weekend and then will go back to Long Island for a short while. On April 3 we have been here for three months and have to get back to an immigration office to get our other three months. The closest are in Georgetown and Long Island.